Lalique Tabletop Lighter with Two Lion Heads done in Frosted Glass. A Great Gift Idea. Very-Nice-Cond. Beautiful Lalique Lion Headed lighter. Any creation by Lalique makes it one to behold and the two headed lion in frosted glass is no exception. It beautiful and it is perfect. It has been used sparingly if at all. For someone that collects Lalique glass from the ages, this is a must. You can proudly display this one at your next social gathering and impress your guests by showing the Lalique signature that appears on the base. There is a label identifying this as a Lalique as well. It would also make a great gift for the special someone in your life. I do not have the original box. I am offering free shipping in the USA. International shipping is available and please see shipping profile GREGS for international rates. 2 Vintage Ronson Queen Anne Tabletop Lighters for one money. A Nice Valentines Day Gift. Lalique Frosted Crystal Doves 1/4 oz. Parfum Bottle containing Nina Ricci L'Air du Temps Parfum. Would make a very nice gift. Vintage 9" Hand Painted Frosted Glass Vase. The Base was Applied During the Manufacturing Process. Near Perfect if not. No chips/cracks. Vintage Occupied Japan Flip Top Table Lighter. Nice Ceramic Base. In nicely used working condition. Circa 1946-1947. A great gift idea. It is a wonderful piece. Fast delivery. Recommend this seller. Just what I wanted at a very reasonable price. Thank you for the prompt shipping. 7 Piece Westmoreland 9" Pitcher and 6 Matching Glasses 5 3/4" T. All are Milk Glass, all are Paneled Grape. Makes A Beautiful Holiday Gift. Vintage 1830-1870's Cast Iron Pan/Skillet with Long Gatemark. Historic Piece. Great Condition. 3 Short Legs. Professionally Cleaned. Oiled. What an extraordinary experience with this number one fantastic seller! The communication could not be better and what a wonderful person to deal with! Love the pitcher that was packed very well and lightning fast shipping too! Will visit often! Thank you! Vintage 19th Century Green Glazed Redware Pitcher. 7" Tall. 6" from Rim to Handle End. Has some glaze that has chipped off. Small rim chip. 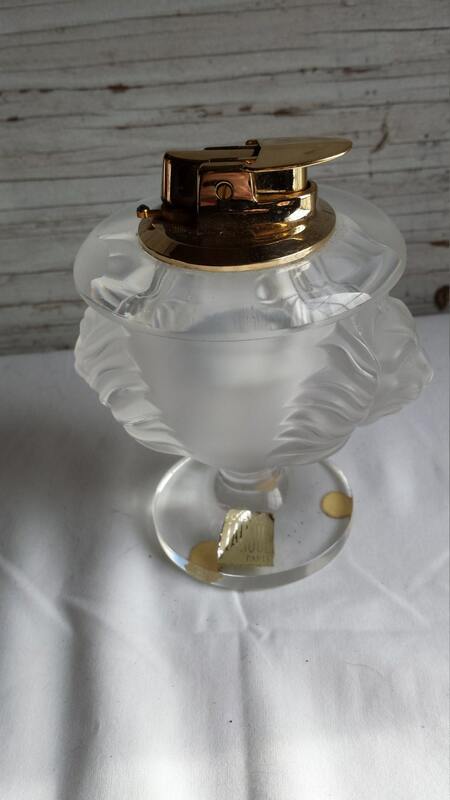 Vintage 1960s Rivo Swiss Made Ladies Lighter/Clock. Beautiful Goldtone lighter. Swiss Made. The Clock would not set. Clock is by Nelson. 3 Vintage 1992 Marlboro Adventure Team Butane Lighters. 2 are black while 1 is yellow. All are new in the box. Vintage Advertising Park Lighter for Link-Belt-Speeder. Manufactured in Murfreesboro-Tenn. Working Condition. Fleur-de-Lis Design. See pics.